If you have forgotten your password, on the login screen click "Forgot Password?" You will then be prompted to enter your email address that you registered with. 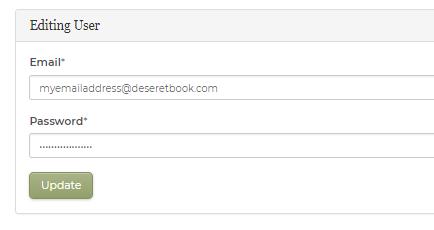 Within a few minutes you will receive an email from Deseret Book with a link for you to select a new password. This link will expire shortly, so click on it as soon as you get it. Once you click on the link in the email, you will be taken to a screen to reset your password. To change/update your password while you are already signed in, click on My Account. Under the My Account Details panel, click on the green ( Edit ) button. Here you can update your email address and/or password. After you click on Update, you will be taken back to the login page. Simply login using the email address and new password you set up.